Ordinarily, pitching a pair of premium German arch rivals against one another couldn’t represent a more natural face-off. But despite being oh-so-closely priced and positioned in their makers’ ranges, there’s one level where the Mercedes-Benz A250 Sport and BMW 125i couldn’t be more misaligned. Different driven wheels? In part, yes, but it’s more about the backstories behind it. See, this BMW is almost certainly the last of Munich’s rear-driven small cars. The Mercedes-Benz, though, represents the first of a new dawn in Stuttgart-bred front-drivers. Essentially, these close segment rivals are at completely opposite ends of their respective evolutionary curves. BMW will soon wave the white flag, its 1 Series and 2 Series set to follow its Merc and Audi contemporaries down the front-driven small car route. And it’s the A-Class, as much as any factor, that’s forced BMW’s hand. What do we hope to learn here? If the 125i is the all-round finer small car, we’ll see what BMW stands to lose. Should the A250 Sport win, we’ll see what Munich has to gain – perhaps justifying, for both marques, the move to front-wheel drive. And, as properly hot hatchbacks – albeit a rung below their performance-leading M135i and A45 brethren – any difficultly in splitting the two inevitably questions if the choice of driven wheel really even matters. As outlined in our standalone test of this car, the 2015 mid-life update bundles in a host of M Sport Package joy for its $48,900 (plus on-roads) ask. This means that lowered/retuned suspension, ‘M light’ 18-inch wheels with narrow front/wider rear stagger, sports seating and steering wheel, and M Sport brakes comes as standard where it was a $4000 extra. There’s also no added cost for a self-shifting transmission, as the eight-speed paddleshifted torque convertor automatic that backs the 125i’s 2.0-litre turbocharged four is the default specification. So far, so wallet-friendly… before an alarming $12,490 of cost options are factored in. These include a Comfort Package ($2100, adding seat heating and electric/lumbar adjustment), premium leather trim ($1690), sunroof ($2000), internet ($154) and ConnectDrive Concierge services ($330), Innovations Package ($2790, adds parking and driving assist systems, high-end satnav, DAB+ radio and adaptive cruise), Adaptive M suspension damping ($1092) and metallic paint ($1142). By the time it pulls the handbrake on this slippery slope of options, our test car, at $61,390 plus on-roads, is touch-parked right up against the heroic $62,900-list M135i, of which some of these features are standard. The A250 Sport lists for a slightly pricier $51,000, a seven-speed dual-clutch gearbox tied to its 2.0-litre turbo four the only transmission available. Like its nemesis, our test example has fallen over the options cliff and hit a number of pricey outcrops on the way down. These include an Exclusive Package ($1490, high-end leather trim, Artico dash, red stitching, dual-zone climate control), Comand Package ($2990, HDD satnav, high-end audio, DAB+ radio), Driving Assistance Package ($2490, adaptive cruise, blind spot and lane keeping assists), Seat Comfort Package ($990, electric/heated/memory functionality), 19-inch AMG wheels ($690) and metallic paint ($1190). All of which bumps up the as-tested price to $60,840 plus on-roads, a negligible $550 more affordable than our orange BMW. However, neither car is left wanting in basic specification. Both cars get parking sensors and reverse-view cameras, cruise control, switchable driving modes, LED headlights, heated wing mirrors, multifunction steering wheels, speed-variable power steering, Bluetooth connectivity, sat-nav. In basic form, the A250 Sport gets manmade leather and microfibre trim, while the 125i is fitted with cloth and synthetic suede. Both offer wide-ranging electronic safety systems, each with their own staged warning and autonomous braking functionality when potential frontal collisions are detected. That said, the A-Class gets nine airbags to the BMW’s six. Of the two, it’s the BMW’s cabin that struggles the most to drag itself out of last decade, particularly the wheel and instrumentation, both of which look downright ‘classic’. That’s no foul – the BMW’s more mature and conservative design will win favour with some buyer tastes – and the stylised curves across the dash, infotainment screen and door trims inject an air of freshness. It’s the more austere offering, perhaps, though one not lacking for classiness, which extends to the quality of materials and general fit and finish. Two years on from its release, the once cutting-edge A-Class interior design is beginning to look downright conventional, though it dodges the BMW’s dowdiness with an abundance of perforated, faux carbon-fibre, double-stitched, red-accented and alloy-tinged jewellery. It’s ‘Sport’ in nature as much as name, then. The material mix, particularly the quality of the plastics, is a little more hit and miss once you have a good dig around. That said, the A250 Sport’s interior presentation alone has no doubt enticed many a buyer – young or young at heart – into the Mercedes-Benz fold. It’s a shame, then, that the Benz lets the team down in ergonomics. The A-Class has a shallow footwell and high-set brake pedal, restricting legroom. And the naturally low-set front seats, which are shapely and offer good lateral purchase, provide little under-thigh support. In short, the front seating is plain awkward. The BMW’s longer cabin, deeper footwell and larger floor-to-seat base design allows a more natural seating position with better long-haul support and comfort, and without unnecessarily robbing the second row of knee room. Given there’s $3790 worth of front seat updates alone, it’s of little surprise that the BMW pews are about the finest you’ll find in any small car. There’s more head and shoulder room in the first row too, so the 125i is a little less claustrophobic. In overall cabin space, it has elongated (shrunken 3 Series) sedan proportions rather than having that boxy hatchback vibe. With key touch points, both offer slick, upmarket multifunction steering wheels, the Merc unit more comfortably contoured than the almost comically chunky BMW design. But in the battle of (optional, high-end) infotainment systems, the BMW’s Navigation Professional not only layers on real-time, three-dimensional bells and whistles more impressively, its iDrive rotary console controller interface is quicker and more intuitive to use on-the-fly than Benz’s Comand system. Neither car is generously comfortable or roomy in the second row, but, given the aforementioned quirks of the A250 Sport’s front seating, it’s the BMW that offers the most natural format for moving four adults for long trips. The transmission tunnel does eat into middle position foot room, although, frankly, there’s not enough space across the back row to fit three adults anyway. The 125i offers around 360 litres of boot space with second row seating in play, which is 19 litres more than that of the A250 Sport. With their 60:40 split-fold rear seats folded, the BMW again wins the cargo-swallowing bragging rights, its 1200 litres of volume supplanting the Benz by 43 litres. Fancy cost options or not, the BMW edges ahead here by offering a more commodious and liveable interior. 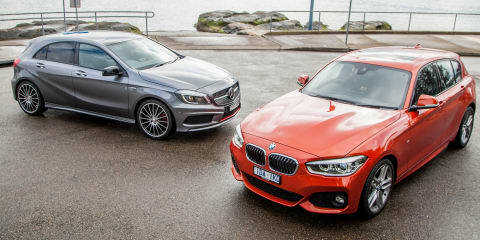 Both have direct-injected 2.0-litre turbocharged four cylinder engines, the BMW’s 160kW (at 5000rpm) surpassing the Benz’s power peak by five kilowatts, which arrives 500rpm higher (5500rpm) in the rev range. The A250 Sport, though, plies substantially higher at 350Nm – a 40Nm torque benefit over the 125i. The Benz’s 350Nm peak torque arrives at just 1200rpm and hangs on until 4000rpm, whereas the BMW’s more modest 310Nm, while arriving at the party fractionally later at 1350rpm, hangs around until 4800rpm. So, on paper at least, they’re slightly different animals, each driving torque to an opposing end of the chassis using markedly different transmission systems. As far as acceleration goes the BMW brings with it 6.2-second 0-100km/h claim, the Mercedes-Benz a 6.6. While the BMW offers four selectable drive modes (Eco Pro, default Comfort, Sport and Sport +) the Benz has a choice of three (Comfort, Sport and Manual). The Benz has the stronger sporting pretension, its engine the brashest in note, that signature rev-matching ‘blatt’ during upshifts adding sonic fanfare. In Sport drive mode, it’s quite an event to drive, the 7G DCT hanging onto each of its seven forward gears tenaciously or rapid-firing between them, a thing of satisfying potency that’s perhaps a little too highly strung for around town driving unless you’re really on a mission getting A to B. But Sport mode is often the shrewdest choice because Eco mode is so damn lethargic. In its default economy setting, the tiresome foibles affecting so many dual-clutch powertrains are ever present: it’s always reaching for the tallest gear possible, the throttle is lazy to respond, and when you do dig in there’s a lot of clunking and thumping at low speed. The only method of discovering silky refinement in normal driving is with gentle, concentrated throttle inputs – a chore in itself. Like so many dual-clutch equipped small cars out there, the A250 Sport is begging for a middleweight not-too-lazy, not-too-eager drive mode. So often (and wrongly) considered the lower-rent transmission design, the BMW’s eight-speed, like any well-sorted torque convertor auto, is so seamless that it makes dual-clutch feel downright agricultural. Particularly in low-speed and stop-start driving. It’s less lazy, more ‘at-arms’, and is noticeably more driveable tied it its respective engine, which quickly proves to be a thing of lag-free sweetness and flexibility. From 1350 through to a 6000rpm cut-out, the 125i pulls like a freight train, though unlike the A250 Sport its responses are amply alert in Comfort drive mode, but without the rpm-hungry histrionics the Benz displays in Sport mode. Activating the BMW’s own Sport mode produces a nice flexing of the muscles and heighten of responses. No spiky peaks or snoozy troughs, the 125i moves between swift and leisurely urban driving in a more user-friendly way, though lacking none of the Benz’s potency and immediacy once the red mist descends, particularly in Sport + mode. Its upshifts are just as crisp as the Benz’s, with the added benefit of offering the driver both wheel- and console-mounted gear shifters (the A250 Sport makes do with paddle shifters). Though the BMW has the more fuss-free around-town persona, they’re both a hoot on the march. Neither struggles off the mark, though the rear-driven 125i hooks its rubber to the asphalt a little more assertively than the Benz, which is a little keener to break traction. For rolling punch, too, the BMW mans the action stations when overtaking and embraces lane-changing opportunities slightly quicker. Neither feels the confidently quicker device, and like their identical acceleration the claims for fuel consumption are an identical 6.4L/100km. Both returned markedly thirstier eight-something figures, though, again, neither was measurably more frugal. By measures stopwatch or fuel bowser, then, it’s a dead heat. And while both get the pulse racing to equally brisk beats, the BMW is patently the more driveable choice across the broader on broader experience. And thus, once again, it gets the nod. Both protagonists offer bona-fide hot hatch power and pace, though as middle-rung variants of their respective premium range – each offering hotter performance models – surely the most finely struck ride and handling balance will shine the brightest here. The Benz backs up its sporting pitch with a deft combination of sharp front end and fantastically connected steering that clear, linear and supremely accurate. Point the A250 Sport into a corner and its easy to place the hatch exactly where you want it. Those optional 19-inch wheels – an inch-larger than standard – seem both a blessing and a curse. They look fabulous and impart an extra, almost A45 AMG-like crispness and edge to the dynamic package, but the trade-off is that the ride quality feels particularly jiggly across less-than-manicured public roads. The BMW does a better job of isolating road imperfections from driver and occupants, and not merely because optional adaptive dampers are fitted. The 125i’s firmer damping setting is generally better-resolved – more absorbent over large bumps, less hyperactive over small imperfections – than the Benz’s singularly focused state of tune. The ride quality is so markedly more relaxed in the BMW that you might reasonably expect comparatively diluted dynamics. Not at all. While its 225mm front rubber transmits information at the pointy end a little less assertively than the 235mm-shod Benz, the 125i leverages fat 245mm rears and focuses its chassis balance accordingly. The upshot is that, from behind the wheel, it feels lighter up front and drives more assertively from the rear – of course, in classic rear-driven manner. However, the pair couldn’t characteristically be more different – the Benz drills into the tarmac like a Scalextric toy, sits flatter, leverages roadholding grip to link apexes with gusto; the BMW is lighter on its rubber feet, more playful in response to driving inputs, more animated under power, and dances from corner to corner in a more point-and-shoot manner. In essence, the 1 Series feels all the part like a shrunken 3 Series. The A-Class, though, has no driving synergy with a C-Class whatsoever. That’s no slight on the A250 Sport, because its well-sharpened persona is superb by front-driven hot hatch measures. It could be argued that the BMW is the better fit for those with more discerning driving tastes, the car for the more highly skilled driver. That’s simply not true. The 125i offers safe and engaging transit for the modestly skilled; the A250 Sport is suitably capable enough to entertain the most seasoned weekend warriors. Both are nimble, quick and engaging to punt, they’re simply different enough that choosing the better driving tool is best decided on personal taste and preference. For their handsome price tags, the integrity of other systems surely come into play, though they’re a tough pair to split. The speed variable power steering systems are pleasantly light for low-speed manoeuvring, though the BMW system is slightly less synthetic in adding weight and heft at higher speeds. Both have unintrusive stability control systems, though the Benz triggers with a little less provocation. And while both have strong, durable braking systems, the Benz is noticeably more abrupt under foot. Nothing in it here, though it’s the more pleasant ride quality that put the 125i ahead here by a nose. Both the 125i and the A250 Sport are covered by three-year, unlimited kilometre warranties. Service intervals on the A250 Sport are 25,000kms or 12 months, whichever comes first, with prices capped for the first three services, $396.00 for the first service and $792 for the subsequent two intervals. BMW Upfront Inclusive offers a Basic package (fluids, filters, inspection) with a one-off payment of $1140.00 which covers essential servicing for five years or 80,000kms, whichever comes first. As the mid-range sweet spot in ranges that define the forefront of small-car quality, both the 125i and A250 Sport are exceptional offerings, albeit arguably moreso without pricey options as tested. Both offer high levels of performance and comfort, but it’s the BMW that pips the Benz at the post almost everywhere you look. The 125i’s victory here, then, is a shoo-in. The current 1 Series – the finest to date – proves that you don’t need the front-drive format or a dual-clutch transmission to produce the finest small car on merit. A battle nicely won, then. But the success of the A-Class, its impact on both Mercedes-Benz business and the premium small-car landscape, and its influence in forcing BMW to almost certainly conform with front-driven convention in future generations, is perhaps a more large-scale victory in war.